George Lopez is a comedian with both a heart and a conscience. He is best known as the co-creator, writer, producer and star of the ABC and Warner Brothers sitcom, The George Lopez Show (executive produced by Bruce Helford and Sandra Bullock), however, his immense talents are not limited to the television realm. Lopez is a multi-faceted performer whose charming, likeable personality shines on stage, film and television. He has earned kudos for his performance in the HBO drama, Real Women Have Curves, which premiered at the 2002 Sundance Film Festival to tremendous reviews and received the prestigious Audience Award. Previously, Lopez was featured in the acclaimed drama Bread and Roses. This film, directed by British filmmaker Ken Loach, received critical acclaim after its premiere at the Cannes Film Festival. George’s numerous television credits include Fidel (Showtime), Frank McKluskey, C.I. (Disney), Good Morning America, The View, Live with Regis and Kelly, Craig Kilborn and Resurrection Boulevard. George frequently hosts Univision’s Loco Comedy Jam. Maintaining an extremely active schedule as a stand-up comedian, George has sold out virtually every top comedy club in the nation and headlined concerts at such prestigious venues as the ARCO Arena in Sacramento, the Shoreline Amphitheater in San Francisco, the Majestic Theatre in Dallas and San Antonio, the Wiltern Theatre in Los Angeles, and the HBO US Comedy Arts Festival in Aspen, CO. Always the socially conscious comedian, George devotes much of his time to the community including working as a spokesperson for high-profile charities and foundations like the LAPD’s Stop the Violence program. He has received the National Hispanic Media Coalition Impact Award, the Manny Mota Foundation Community Spirit Award and was named Honorary Mayor of Los Angeles for his extensive fundraising efforts benefiting earthquake victims in El Salvador and Guatemala. George’s own charity, The George & Ann Lopez-Richie Alarcon Care Foundation, provides significant resources to community and arts groups. George is always one to remember his roots and keep a strong political conscience. Do you want to hire George Lopez? Directly request a quote. In 48 hours we can send you the availability of George Lopez If you would like to book George Lopez, Entertainment Booking Agency is the right place. 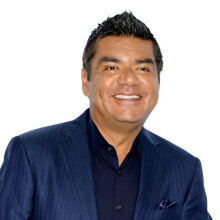 We will offer you the best price and contact the management or we directly contact George Lopez. For corporate appearances or speaking engagements you can contact our agents and the will help you true the process. Tags: hire George Lopez, George Lopez booking, book George Lopez, George Lopez appearances, find more information on booking George Lopez for appearances, George Lopez speaking engagements, George Lopez endorsements/spokesperson, George Lopez appearance fees, George Lopez booking agency contact info, biography of George Lopez, Contact an artist booking talent agent find a speakers bureau that can book George Lopez, speaker booking agency for George Lopez, George Lopez booking agency, George Lopez booking for corporate event. EBA is one of the biggest entertainment booking agencies in the World. We book hundreds of celebrities, artist, athletes and speakers in a year. Important to know is that we are not claiming to be the management of George Lopez. We are not the official agent for George Lopez. Companies from around the globe book these artists and speakers true our company be course we have one of the biggest networks and we always have direct contact with the artist or the management. We help you to find the right celebrities for your corporate of private events. Please contact one of our agents to get free advice and we will help to get the world-famous artist on your party.